This is the final ‘chapter’ of a 3-part article about Auguste Escoffier’s School of Culinary Arts’ Home Cooking series. 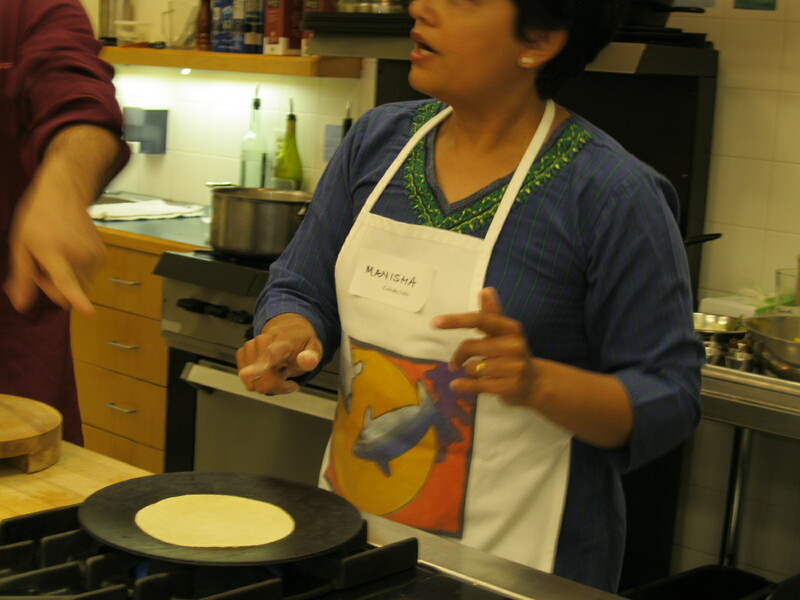 The class was called Culinary India, and focused on home-cooking as it is actually practiced in India. Part one of the article was about the chefs and guest lecturers; part two was about Escoffier’s programs, and part three, below, contains a few of the recipes we learned during the two-day class. Enjoy! Preheat oven to 400F. Whisk the honey, oil, salt, pepper, GM, paprika and cumin in a small bowl. 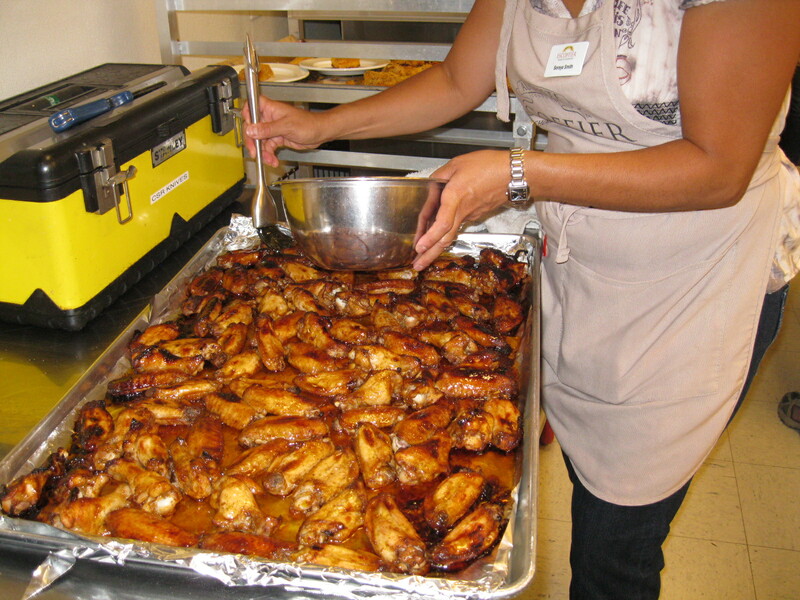 Scrape the mixture into a gallon-sized Ziploc bag, add the wings and coat well. Refrigerate for at least 30 mins, preferably overnight. Line a rimmed baking sheet with foil and place a wire cooling rack on top of the baking sheet. Arrange wings in single layer on rack, bake for 35 mins. Remove wings and baste with ¾ cup of tamarind chutney. Place back in oven and continue roasting until slightly charred and crispy; 15 – 25 minutes. Remove, sprinkle with salt and cool 5 mins before serving. Heat the oil, cumin, ginger, cayenne, fennel, asafetida, and GM in a medium saucepan over medium high heat until the cumin is fragrant and lightly toasted, shaking the pan often. About 1 minute. Whisk in 2 Cups of water, sugar, and tamarind concentrate until fully dissolved. Bring to a boil, reduce heat to medium and simmer until the sauce turns dark brown and is thick enough to leave a trail on the back of a wooden spoon. About 20 or 30 minutes. Remove from heat and let cool. Ready! Wash and peel the kohlrabi and discard all tough fibers; slice long and slender like a french fry. Heat oil in kadhai; add mustard seeds when hot. Once seeds start popping, add asafetida, turmeric and chili powder. Quickly add chana dal and kohlrabi and mix well. Add tomoatoes, then stir in the brown sugar and salt. Add about ½ Cup of water. Cover and cook until kohlrabi is tender but not soggy; about 15 minutes or so. Add more water if it looks dry. Serve hot with fresh rotis. If using canned pineapple, drain. 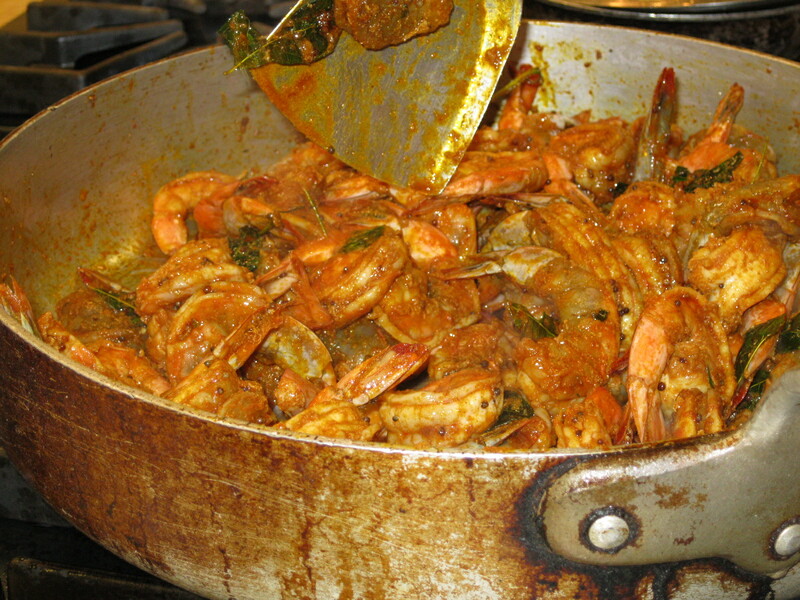 Heat a cast iron skillet to medium heat and add ghee. Fry slices on both sides, remove when brown spots and carmelization occur. Add jaggery to same skillet, along with 2 TBS water; stir. When jaggery has dissolved, reduce heat, and stir in honey and cardamom. Simmer for a minute, and then remove from heat. 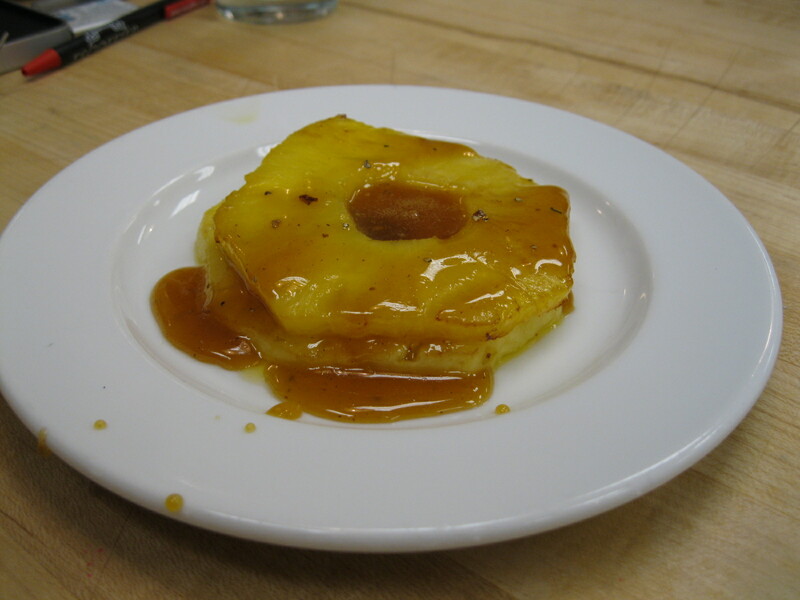 Drizzle jaggery sauce on pineapple slices, and serve. Thank you, Allan, for sharing these recipes! I hope you enjoyed yourself as much as we did. I think I need to make the caramelized pineapple for desert soon! Next Next post: What’s your Dreamstaurant?